Well, I didn’t see much of the Mavericks/Heat game, but found out my team lost. Hopefully they’ll improve on their home turf. Petey and I got a late start to the morning – neither of us felt great. 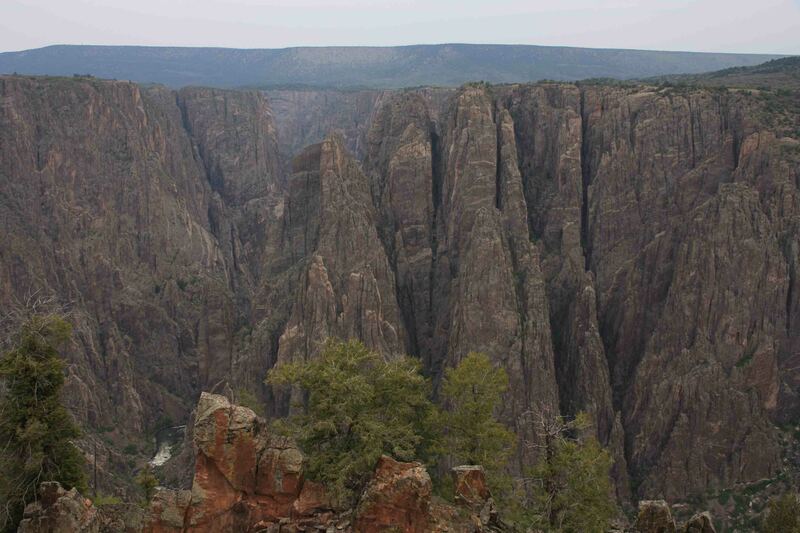 We finally arrived at Black Canyon of the Gunnison National Park around 10 a.m. where we drove along the rim to a number of overlooks. Petey was allowed at the overlooks, so he was able to join me on a few short walks with a 400 yard roundtrip limit. 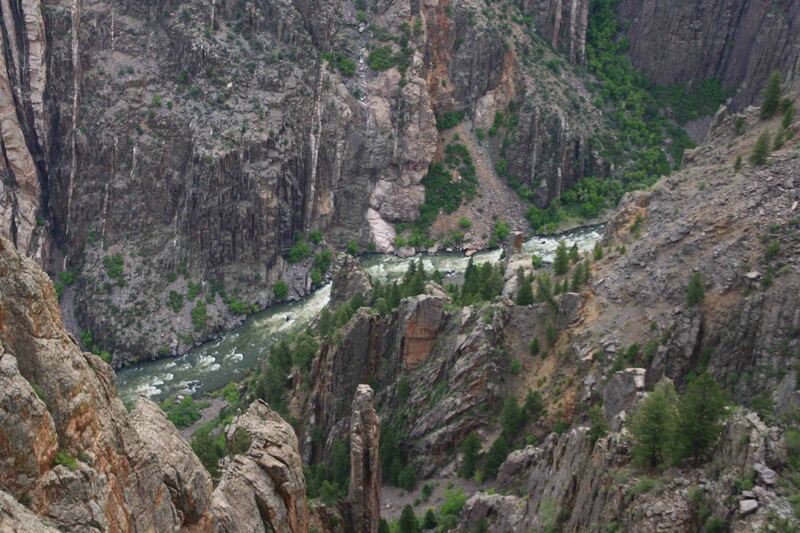 In just 48 miles, the Gunnison River loses more elevation than the Mississippi does from Minnesota to the Gulf of Mexico. 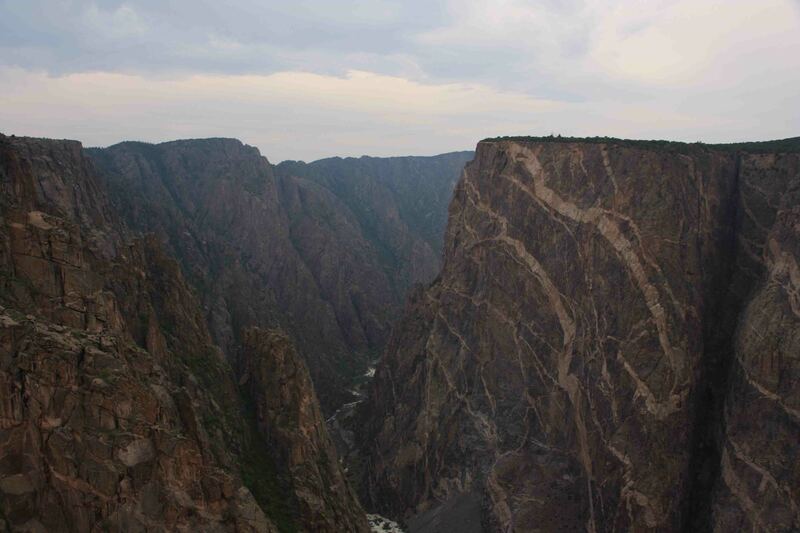 The Black Canyon includes the highest cliff in Colorado as well as a myriad of pegmatite dikes. According to the information board, pegmatite dikes have been forming over the last billion years when molten rock was squeezed into fissures producing light-colored bands which thread Black Canyon’s dark walls. As the hot liquid cooled, minerals formed into crystals such as mica, feldspar, quartz, and garnet. The light-colored bands of igneous rock, also known as pegmatite dikes are more resistant to erosion than the dark gneisses. As a result, parts of the canyon walls have a fin-like appearance. The highest cliff in Colorado is called Painted Wall. Standing at 2,300 feet, it is nearly twice the height of the Empire State Building. The magnificent pattern formed on the wall is also a result of molten rock cooling and hardening within fractures of the existing rock. The Painted Wall Overlook may have been my favorite as we meandered past a variety of yellow, purple, and red wild flowers for an excellent view of the rock face towering over the river below. After visiting Black Canyon, we backtracked through Montrose to Ridgway, where according to my book, old westerns such as True Grit and How the West Was Won were filmed. We simply passed through town and climbed the Dallas Divide to ultimately reach Telluride. I visited Telluride five years ago for a friend’s bachelorette party and had an awesome time. We rented a house, hiked, kayaked, attended the Bluegrass Festival, and enjoyed some colorful drinks at a restaurant on top of the mountain. I was very excited to return despite experiencing the town in a more “roughing it” manner. 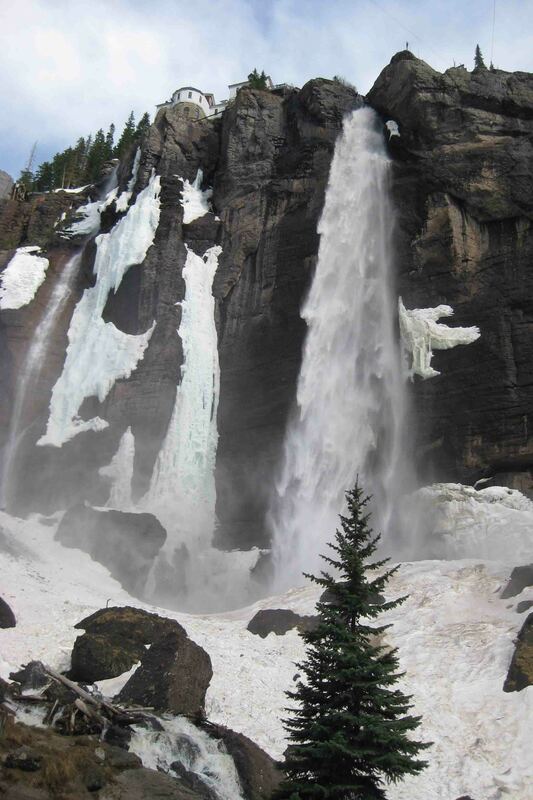 This afternoon I returned to Bridal Veil Falls, only the weather five years later was much cooler. If I recall, previously Telluride was suffering a drought and the river that runs through town was extremely low. 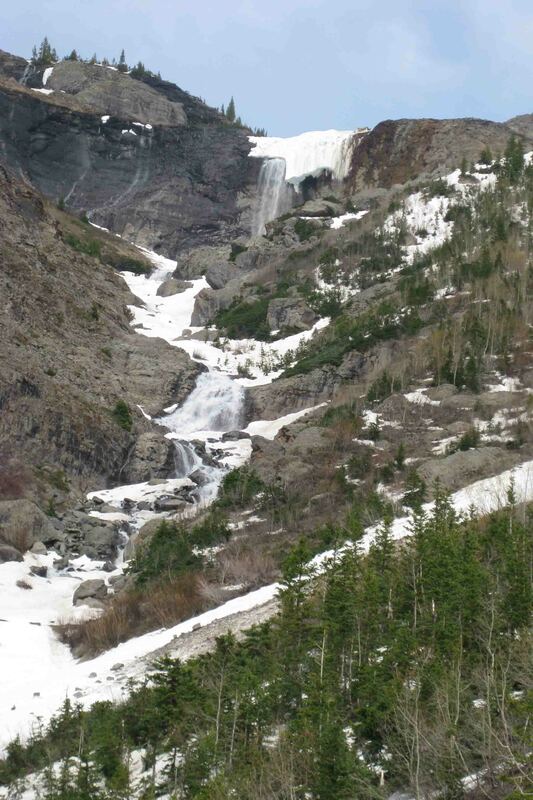 This year, I counted at least four different waterfalls tumbling down the snow patched mountainside as I walked the rocky road to the base of Bridal Veil Falls. I remembered the hike being so hot and tiring five years ago, that I opted for just carrying my point and shoot camera versus lugging my big lens, as I still didn’t feel spectacular. I’m kind of kicking myself for not adding the few extra pounds around my neck as the views were breathtaking. I suspect tomorrow I will be bringing my good camera with me for a different waterfall hike! 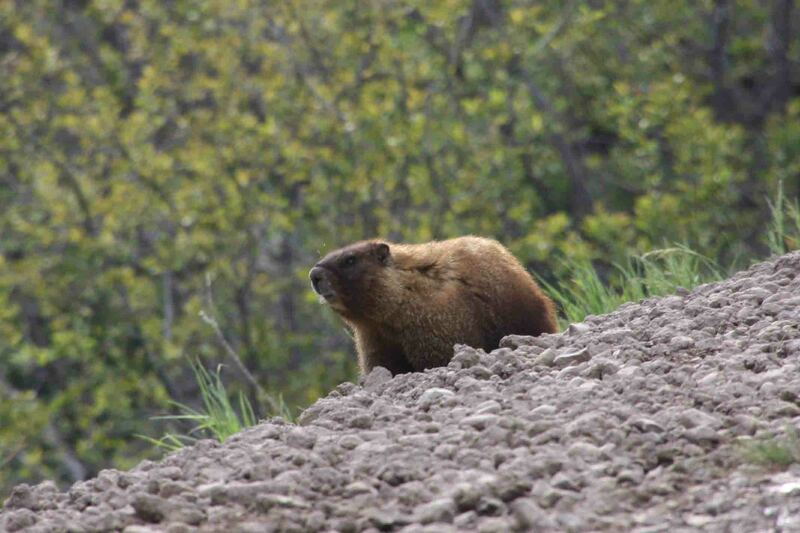 On a different note, as I pulled out of the parking lot, a marmot posed for a picture on the side of the road…I didn’t have to wait long for a photo. I thought the critter was a bear. I don’t know marmots. Guess he was a smallish guy. AWESOME photo of the Marmont!! !